There is something unsettling about this photo. One of the wonderful aspects of our democracy has been the acceptance of the election results by most citizens, and the comity displayed, even if only superficially, by the combatants after the results. In this photo, however, I could not escape the sense that this was Obama rubbing it in. 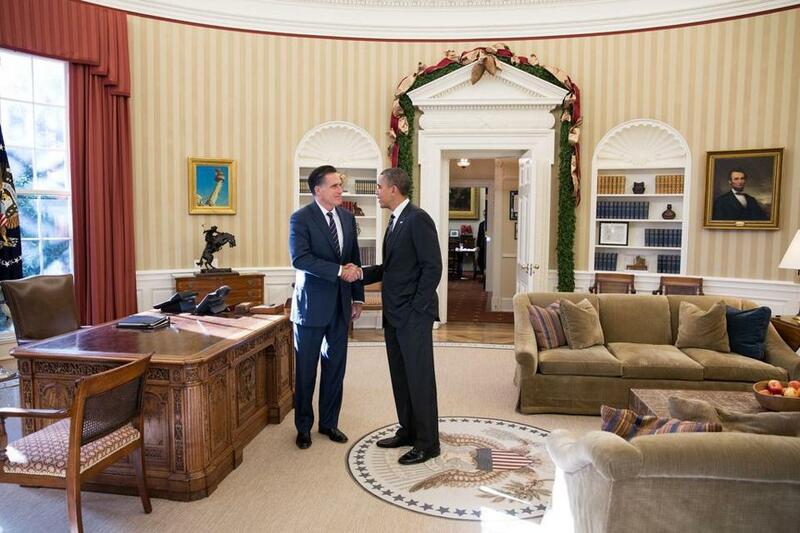 It’s in the Oval Office (perhaps the first time Romney was in it), with Romney having a tight-lipped “smile” and the President casually shaking hands with one hand in a pocket. I guess it is better than a picture of Romney with food hanging out of his mouth at their lunch, but is this truly the best that could be done by the White House photographer? Or, was this perhaps the most awkward post-election meeting ever? In 2008, I scoured downtown Boston for a souvenir copy of the New York Times documenting the election of a black man with a strange name to the Presidency. I wasn’t the only one with that idea and could not find a copy. This year I had no such problem finding multiple copies of the Times even in late morning. Although the 2008 election is undeniably historic, this one may turn out to be much more so, and not because the Commonwealth of Massachusetts has now produced the loser in three of the last seven Presidential elections. Not only did Barack Obama preside over the most difficult economic period in my lifetime (albeit one inherited from his predecessor) and two wars (ditto), but he had to withstand four years of unrelenting attacks questioning his legitimacy. There were, of course, the silly questions about his being an American, and just the week before this election a campaign by someone who may now be America’s biggest (and richest) nitwit about his college transcript and passport. But we also had Mitch McConnell, the Republican leader in the United States Senate (once described – in what now seems laughable – as the world’s greatest deliberative body), saying his number one priority was to defeat Obama in his reelection bid. And that was less than halfway into his first term. With his reeelection, the future of Obamacare – a term once used by his opponents as derision, but now one he has embraced – seems secure. There cannot be an effort to repeal it with a Democratically-controlled Senate and a certain veto, but once its benefits start flowing to all those now deprived of health coverage, it becomes a practical impossibility to repeal. Just as significantly, in an election described as a “big choice” with two “very different visions for America,” Obama prevailed. One pundit said Obama is the first Democrat to win two elections with more than 50 percent of the vote since FDR. I found that impressive until I realized that Bill Clinton is the only other Democrat to even be reelected since 1944. Obama now has the opportunity to leave his mark in ways just as significant as Obamacare. We need to deal with the deficit, and the decisions made in that debate will affect in a major way who we are as a nation. I literally slept a lot better Wednesday night knowing that that effort would be led by Barack Obama and not Mitt Romney and his Republican colleagues. Speaking of the Republicans, what do they now do? I do not mean immediately, although I hope the knee-jerk obstructionism of the past four years gives way to concern for America as their overriding interest. The GOP is now a national party that has received fewer votes than the Democrats in a Presidential election in five of the last six elections. While that is certainly not unprecedented in recent years (see the Nixon-Reagan-GHW Bush years), there are two major considerations that distinguish this period. There are the demographics. It is hardly a secret that the Republican Party has become the party of older, white, and primarily male, voters. Although I am a member of that demographic, I also realize that we are a declining group, both by the forces of nature and increasing numbers of younger and Latino/a voters. When Mitt Romney conducted a major assault on Rick Perry’s policies on immigration and undocumented residents, he may have ensured his defeat several months down the road, but his views were clearly in sync with Republican primary voters. There are leading Republicans – notably former Florida Governor Jeb Bush – who have advocated lessening the rhetoric on dealing with the undocumented and, indeed, doing something positive. Then there is the steadily diminishing connection with reality that is typical of both GOP politicians and their enablers in the media. In the last weeks of the campaign, pollsters were criticized heavily for publishing skewed results, purportedly a reflection of their Democratic biases. Never mind that those same polls showing an uptick for Romney following the first debate were fine. I dismissed all of the optimistic talk coming from Republican circles as the typical puffery emanating from a campaign, but it now appears they believed it, even though there was no – you know – evidence to support it. Jan Crawford of CBS News reports that Romney himself was “shell shocked” when he realized he had lost. Instead of relying on the large number of polls showing a likely Electoral College victory for Obama, he instead relied on his own internal polls that had “unskewed” those polls by diminshing the numbers of Democratic voters. Talking Points Memo had been running a daily scorecard of the national popular vote percentages and the projected Electoral Vote. The percentages were always close, rarely more than 2 points separating the candidates. But the forecasted electoral vote was never close. Most of the time, Romney was at 191 with Obama near 270. At no point during the months of publishing these numbers did Romney ever lead in the Electoral Vote. Never. Remarkably, I did not encounter a single Obama voter who was sure that he would win. Many were confident, but almost all expressed a high level of anxiety over the result. Then we had the election night spectacle of Fox News commentator Karl Rove disputing Fox News’ calling of Ohio, and the election for Obama. Rove was on the phone to Romney headquarters where the disbelief in the Ohio result was such that Rove abandoned any pretense of objectivity. This led to the indelible image of Fox anchor Megan Kelly marching down to a room where the Fox analysts of data assured her that they were “99.95 per cent” sure that Ohio went for the President. This is Fox News we are talking about, not MSNBC, yet the parallel universe inhabited by Romney and Rove is such that even a bedrock conservative news operation had to be wrong. Rove continued to outdo himself when he next appeared on Fox. This time he attributed Obama’s victory to the Obama campaign’s suppression of voters by running a negative campaign. That’s right – Karl Rove criticizing negative ads as causing voter suppression. I guess we now know how George Bush won in 2004. In order to make a statement as ludicrous as that, Rove had to ignore the reality that all of the efforts to change election laws around the country were led by Republican officeholders, with most, if not all, of them being stopped by courts. Unfortunately, this denial of the reality-based world carries over into areas of significant national import. After the devastation wreaked on New York and New Jersey, are we going to have a fact-based discussion on climate change or will we continue to let oil companies dictate national policy? Will a discussion of the deficit and tax policy be based on facts, or will Senate Republicans continue to suppress a non-partisan report disputing a central tenet of Republican orthodoxy? The report by the Congressional Research Service of the Library of Congress concluded there was “no correlation between top tax rates and economic growth” according to an article in the November 2 New York Times. Yet there are good reasons to be hopeful. The highlight of my Election Day was stopping at a supermarket in the Webster Square neighborhood of Worcester late in the afternoon. It was completely dark outside, yet there was a line of 200 people, almost all of whom were African-American or Latino, many with children, waiting in line to vote. I sometimes joke that my voting in Presidential elections in Massachusetts doesn’t matter – after all, this is the only state to vote for George McGovern against Richard Nixon – but these folks obviously had a different view. It was truly inspirational. The conventional wisdom is that Mitt Romney had but one goal in last night’s debate devoted, in significant part, to foreign policy. After all, Romney has no background in the area, looked silly on his foreign trip over the summer, and has a tendency to say stupid things. It’s also an area where President Obama is assumed to have a huge edge. That one goal was to not make a gaffe. And he accomplished it if you read much of the mainstream media, as well as numerous on-line sources. Much of the post-debate commentary has, instead, focused on President Obama’s statement that the military has reduced its reliance on “horses and bayonets.” It was a memorable line, and an obviously rhetorical response to Romney’s comparing our military readiness today with the number of ships the Navy had a century ago. Syria’s an opportunity for us because Syria plays an important role in the Middle East, particularly right now. Syria is Iran’s only ally in the Arab world. It’s their route to the sea. It’s the route for them to arm Hezbollah in Lebanon, which threatens, of course, our ally Israel. And so seeing Syria remove Assad is a very high priority for us. There are only three problems with Romney’s statement. The first is that Iran does not border Syria – Iraq, a country that has also been in the news in recent years, is between them. The second is that Iran needs access to the sea only if you don’t consider the Caspian Sea, the Persian Gulf and the Arabian Sea, “seas.” But the biggest problem, of course, is that he is predicating a potentially dangerous intervention on that part of the world on clearly erroneous assumptions. We are talking about a guy who has twice been a candidate for President, has been running for that office for a good nine years, is reputed to be a data-driven leader, and it appears that he has never looked at a map of the area that has been his primary foreign policy focus? And despite his numerous references to the word “peace” last night, his views before last night strongly suggest that he would not be opposed to yet another war in this part of the world. At least when Gerald Ford “liberated” Poland in his famous debate, war was not a potential consequence of his mistake. I think the rest of the debate was less than remarkable, unless you consider the astonishing ability of Romney to deny his positions and past history – some would call it lying – to clinch the sale to the American people. He does it with such remarkable ease and fluidity that, in a truly bizarre sense, he appears to be credible. He spent much of the time during the Republican debates by saying he would do “exactly the opposite” of Obama in foreign policy. The statement is asinine , of course, – he would remove Obama’s sanctions on Iran, for example – but saved him from coming up with any actual, you know, policies. Last night, he agreed with almost all of Obama’s policies. The big difference, according to Romney, is that he would be a better leader. President Obama came across as more focused, articulate and confident – in other words, the opposite of his first debate performance. The worrisome aspect of his candidacy, however, is a continuing inability to do the selling job that comes so naturally to his opponent. In one of his better responses of the night, he answered Romney’s claim that he did not go to Israel during his post-inauguration tour of the Middle East, the stated purpose of which was to reach out to the Muslim world. Obama responded that in his first trip as a candidate in 2008, he met with U.S. troops, and then went to Israel, where he went without taking donors or attending fundraisers. They were shots across Romney’s bow, but done so subtly that one not knowing the context – Romney’s ignoring service people in his convention speech, and using Israel as a vehicle for fundraising in his panned trip abroad – would miss the point. If you are in one of the so-called battleground states, be prepared for an endless onslaught of ads until election day. The rest of us get a respite from that; we just have to keep our fingers crossed constantly. After getting his clock cleaned by Mitt Romney in their first debate, President Obama could prep by just watching this 12-minute video that Andrew Sullivan posted on his blog. Sullivan entitles it “27 lies in one debate,” but the video lists 31. Some are duplicative such as Romney’s saying his health plan would cover pre-existing conditions – even his campaign backed away from that one – and I am not sure some of them would actually amount to lies. Nonetheless, this is an impressive list of prevarications and misleading statements. One of the difficulties Obama faces in debating Romney is that the challenger lies and/or changes positions with such facility and fluidity that it can be difficult to choose which statements to go after. So, just pick some of the big ones and hammer the point home. Joe Biden showed how it could be done last week, although I would suggest the President not use the same mannerisms and tactics employed by Biden – that’s not his game. Also, don’t count on the moderator to do your job for you. While many (mostly Democrats) faulted Jim Lehrer’s lack of involvement in focusing the debate, the debate format was agreed to by the campaigns. It gave a lot of latitude to the candidates to direct the discussion. One took advantage of that, one did not. In speaking to a Univision forum in Florida, Mitt Romney noted that President Obama has referred to him as the “grandfather” of Obamacare which Romney said he took as a compliment. As Alex Seitz-Wald of Salon observed, “What? Are you even trying anymore?” It’s not just that repealing Obamacare has been a centerpiece of the Romney campaign, but this is at least the third time in recent weeks that he has had to walk back a positive comment on the health care reform. I can only imagine the sleepless nights his staff must be going through as they anticipate the debate in two weeks, given the candidate’s penchant for unforced error after unforced error. Speaking of unforced errors, the number of Republican elected officials disavowing, or running from, Romney’s observation on the irresponsible 47 per cent of the electorate grows every day. When your most prominent supporters are the likes of Pat Buchanan, Ann Coulter, Sean Hannity and Rush Limbaugh, how is that going to help attract the undecided voter? I’ll take a wild guess here. If you put any stock in what any of that foursome has to say, you ain’t undecided. So when is the last time the head of a foreign government made a TV ad in which he is the only person speaking on a subject that is part of a Presidential election? According to Politico‘s Maggie Haberman, Israel’s Prime Minister is appearing in ads in Florida markets that “house some of the state’s largest Jewish communities.” The subject of the ads are Iran and its nuclear threat. It is widely reported that Bibi Netanyahu has all but endorsed Mitt Romney, even though he is apparently unaware that Romney has said his position on Iran is the same as Barack Obama’s. Finally, as apart of an endless series of how dysfunctional our hyperpartisan government has become, Seitz-Wald reports that “Senate Republicans filibustered a bill yesterday to create 20,000 jobs for veterans …. who have unemployment rates far above the national average.” As I was driving today, I also heard a commentary on NPR stating that Senate Republicans have also failed to fund a bill to provide benefits to those 9/11 first responders who are suffering from related disabilities. I’ll check on this tomorrow, but you may hear about it first from Jon Stewart who was instrumental in overturning the GOP obstructionism on passing the bill in the first place. In a Friday interview with George Stephanopoulos of ABC News, Mitt Romney once again demonstrated how craven he can be. There are two big foreign policy stories in recent days, and Romney had been unremittingly critical of President Obama on both, at least until called on them by Stephanopoulos. The first had to do with the attacks on our embassy in Cairo and consulate in Benghazi, with four Americans being killed, including the Ambassador to Libya. An embassy employee in Egypt, acting without clearance from either the State Department or White House, issued a statement criticizing an anti-Muslim film which appeared to be the cause of the rioting. The statement deplored the religious bigotry of the film, but did not state an unequivocal defense of the right to freedom of speech. It was this omission that caused both the State Department and the White House to disavow it. In Romney’s first comment on the crisis, he criticized the Obama Administration because, according to Romney, its first response was to “sympathize with those who waged the attacks.” He later described the Administration as “apologiz[ing] for American values.” Neither statement by Romney had a basis in reality, and he was widely criticized for them, including by leading Republicans. When confronted by Stephanopoulos, Romney did not answer how the embassy employee’s statement showed “sympathy” for the rioters and then had the audacity to say, “I think we said about the same thing” as the White House! When Stephanopoulos questioned Romney about his views on Iran, Romney twice said that his “red line” and the President’s “red line” were the same – that Iran should not be allowed to get a nuclear weapon. This pattern of sharply criticizing the President, and then backpedaling furiously, is not a new one for Romney. When auto executives were seeking federal monies to save the industry just after Obama was elected, Romney wrote in an op ed in The New York Times, “If General Motors, Ford and Chrysler get the bailout that their chief executives asked for … [their] demise will be virtually guaranteed.” When the federal bailout proved to be remarkably successful, Romney started taking credit for it, saying that Obama did what he had recommended. Here is my prediction. Romney is going to let the supposed untruths go by unchecked – partly because he is not a good debater (see the primary debates), and partly because Obama is too careful to throw out “things that aren’t true.” Then, Romney will go on the stump and run ads in which he will characterize true statements by Obama as lies, without his being called upon them in front of a national audience. Because, the body of evidence is that when Romney is challenged, he flops at the earliest opportunity. It’s disturbing enough when a candidate for President lies about a significant matter, but even more troublesome when the lie is part of an effort to politicize a tragedy for our country – on September 11, no less. Rioters in Egypt and Libya attacked embassies of the United States to “protest” an anti-Muslim film that was being promoted by the Koran-burning nitwit Terry Jones. The rioters in Libya killed four Americans, including Ambassador Chris Stevens. An employee in the Cairo Embassy tweeted a condemnation of the film for its anti-Muslim bigotry. According to Talking Points Memo, “the embassy and multiple press reports assert that the statement came before the protests and was intended to head off a confrontation.” The State Department and the White House both disavowed the statement from the embassy employee because it did not also include a defense of freedom of speech by Jones and the film maker.